This Pottery utensil crock is MADE TO ORDER just for you! Please allow time for production. Available utensil holder quantity is for ordering purposes only, it does not indicate stock on hand. Please check current production time during checkout. Handmade pottery crock Utensil holder. Great ceramic storage container for the kitchen or bathroom! This utensil holder crock holds many kitchen utensils, or can also be used as a wine chiller or flower vase. All stoneware pottery crocks are approximately 7 inches high. Please use drop down menu to select desired width of your ceramic utensil holder. Utensil Crock pictured is approx 7in x 7in. This is a stock photo. Each utensil holder is individually made. Natural variations will occur. The quality & craftsmanship on this is exquisite. I had a question midway through the process & seller's communication was quick & helpful. I'm really pleased with what I received. I do have a few practical issues (I would absolutely still buy again, but they're something potential buyers might want to consider). It's a bit bigger than I had in my mind's eye - normally I buy honey in pint jars. This could hold a whole quart, which is a lot to have open at any one time. Also, the hole for the dipper is large enough that there's no kind of seal on the lid. There's nothing to keep dust and bugs out of the honey. So between those two, I haven't quite decided how I'm going to put this into use in my kitchen. Those issues aside, I really do love this jar. It's gorgeous and the design is exactly what I wanted. So lovely! Can’t say enough about these plates! They are perfect! We accept PayPal and credit cards through the ETSY Direct Checkout. You can also pay with your credit card at PayPal even if you DON'T have a PayPal account. Orders shipped to an address in IN will be charged 7.5% Sales Tax. ETSY will automatically calculate and charge the tax. I package my items very carefully, but occasionally accidents happen. If your item arrives broken, please notify me within 3 days. You will need to submit photos of the item and the packaging material so that an insurance claim can be filed. Items can not be replaced until photos are received. You do not need to return broken items. If for any reason you are not happy with your purchase please contact me within 3 DAYS of the receipt of your purchase. Return shipping fees are the responsibility of the BUYER. Items must be returned and received in original packaging in original condition and shipped with Delivery Confirmation. Returns must be received within 10 days. Refunds will be issued as store credit. Shipping charges are non refundable and will be deducted from credit. Cancellations will be accepted within 3 days of order. After 3 days, cancellation refunds will be issued as a store credit. Please note the expected shipping time before you place your order. All items are made to order. On most domestic (US) orders, we use USPS and we ship by Priority Mail. Please note the current production time before placing your order. You will receive tracking information when your order ships. On Heavier/Bulkier Items we may ship by UPS. We will always ship by the quickest means to avoid extra handling/transit time unless you request a specific method (Additional Fee). Insurance is not generally included in these options, although limited insurance is included on US Domestic Priority Mail shipments ($50). To purchase additional insurance please notify us in “Notes to Seller” and we will bill you separately. Items shipped without insurance or to an incorrect address are the responsibility of the buyer. If your Etsy address does not match your Pay pal address, Items will be shipped to your Etsy address. We can ship your item to a different address and include a gift card at no additional cost. Let us know in the “Message to Seller” during checkout, or through the Etsy Convo system by pressing "Contact seller" under any of the listings, previous to payment. Tell us the name of the gift recipient and if you wish a short message on the gift card. No refunds or credits will be given for items lost due to incorrect mailing address, or for mistakes on the greeting. All photos shown in our shop are stock photographs, so the item you receive will vary slightly from the photo. I am not a production potter. Each piece is hand made and there will be slight shape, size, and glaze variations even within dinnerware sets. Items may contain slight imperfections... but that is the charm of handmade dinnerware. ----PLEASE READ THIS BEFORE ORDERING!! All items will be MADE TO ORDER it may take me 6-10 weeks to make and ship. Please contact me for current production time. Orders containing large dinner plates may take longer as kiln space limits the number that can be fired at one time. Please MAKE SURE YOU READ THE LISTING AND SHIPPING SCHEDULE before placing your order, and let us know of any deadlines you may have. Dragonfly Pottery is food safe. I use commercial clay and glazes that have been strictly tested. 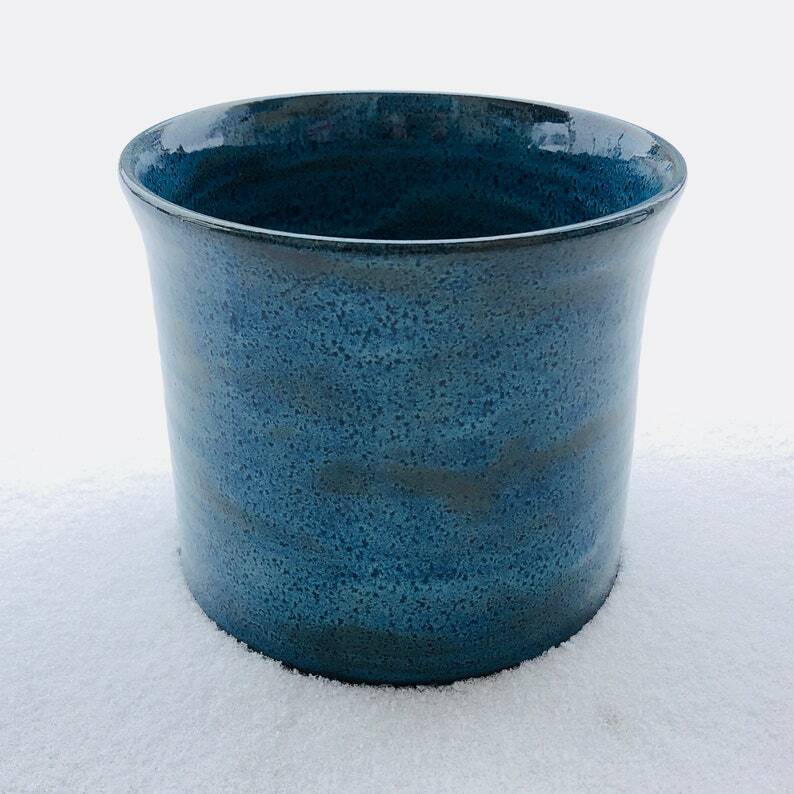 Pottery is durable, but avoid sudden temperature changes. - hot to cold or cold to hot. Thermal shock will cause pottery to crack/break. Do not put pottery in a preheated oven. Pottery must be heated WITH the oven to avoid thermal shock. Do not heat frozen items on pottery. Do not place hot pottery on a cold surface or submerge in water. Do not use pottery on stove top. Pottery is microwave safe. Do not use for prolonged microwave cooking. Do not microwave frozen meals on your pottery. Pottery is dishwasher safe. Hand washing is recommended. Allow pottery to cool in dishwasher. Do not put cold food or drink in hot dishes.